A North Carolina A&T alumna attended a game on Monday and she encouraged students to enjoy cheering on the team. North Carolina A&T swept Maryland-Eastern Shore on Monday night at home. The women cruised to a 70-58 win to stay perfect in the MEAC. The men, meanwhile, picked up a tough, but solid 68-61 win to stay within striking distance of the MEAC title. The win improved the A&T’s men’s record to 8-2 in conference play while the women are now 10-0. So it was a solid night to be in Corbett Sports Center. But one fan wasn’t satisfied with what she saw. Not from the teams, but from the fans. 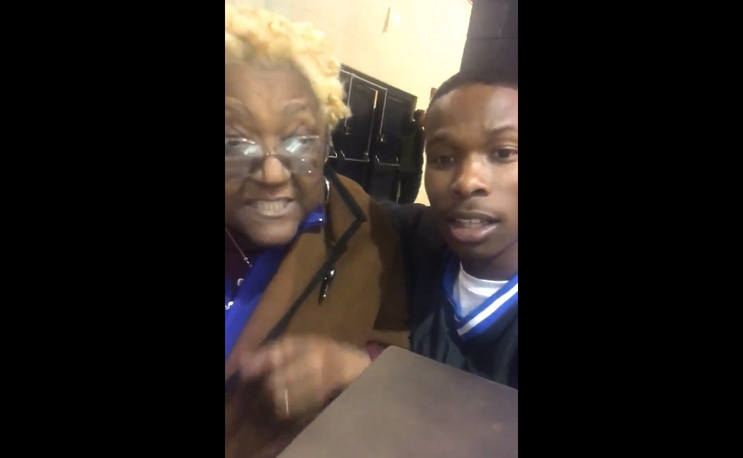 A&T MC/host Shakari J. posted a video with an alumnus named “Ms. Freda.” She emplored the A&T students to stand up and cheer more. It’s not just an issue in Greensboro. It’s an issue that athletic departments around the country are having to deal with. The first hurdle is just getting students to attend games. At most HBCUs, athletic fees are paid by students, making up the bulk of the revenue. This allows them to attend any athletic event on campus without having to buy tickets, yet many gyms struggle to get filled even halfway outside of rivalry games. Then, once you get students in the doors, keeping them engaged can be a challenge as well as you still have to compete with what is in there cell phones, as many students actually come to the game with headsets (airpods if you are fancy) on. This shouldn’t be suprising, though. The current college freshman was born in 2000 or 2001. They have had the internet their entire lives. They’ve grown up with YouTube. They are literal digital natives who are constantly being entertained, so it’s going to take a little bit more than rolling out the balls to get many of them engaged. It’s vital that HBCUs, in particular, figure out how to engage young students and young alumni as well. Every year at all of the basketball tournaments, the bulk of the attendees in the stands are folks who graduated in the 70s, 60s and even 50s, while the younger alumni are nowhere to be found. Somewhere along the line it appears there was a disconnect that we haven’t been able to fill. Hopefully, Ms. Freda’s enthusiasm will rub off on students and alumni as well.